From the trails found at Upper Snelling State Park all the way out to Sibley State Park in the far northwest corner of the basin a person will find great places for hiking. One of the more exciting trail systems being developed is along the Minnesota River from Upper Sioux Agency State Park downstream to Fort Ridgely State Park. 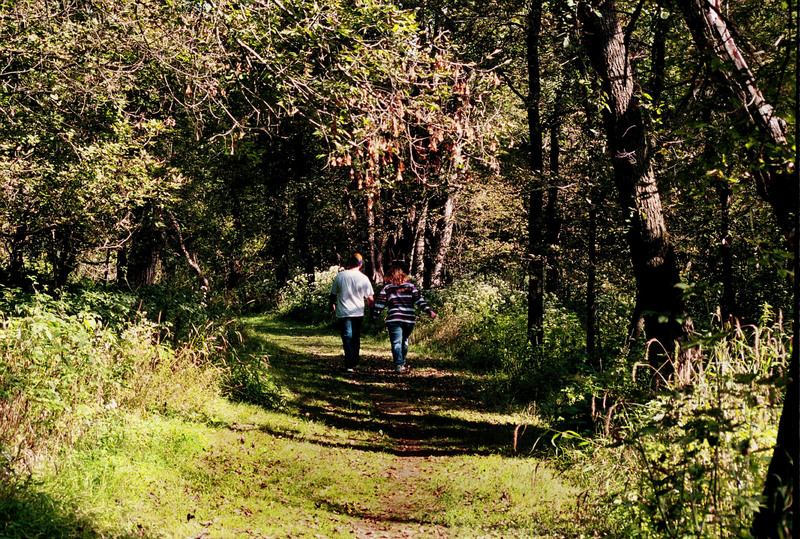 Many trails feature a hike through the woods (Photo below by Ron Bolduan). Big Stone Lake State Park - http://www.dnr.state.mn.us/state_parks/big_stone_lake/index.html Found on east side of the Big Stone Lake, this state park has 3 miles of trails. Glacial Lakes State Park - http://www.dnr.state.mn.us/state_parks/glacial_lakes/index.html On the far northwest edge of the basin, this state park has 16 miles of hiking trails. Lac qui Parle State Park - http://www.dnr.state.mn.us/state_parks/lac_qui_parle/index.html Situated at the south end of the lake, this state park has 7 miles of trails in the upper and lower units. Sibley State Park - http://www.dnr.state.mn.us/state_parks/sibley/index.html North of Willmar, this state park has 2.7 handicapped accessible trails and 18 miles of easy to moderate trails. Monsoon Lake State Park - http://www.dnr.state.mn.us/state_parks/monson_lake/index.html Not that far from Sibley State Park, Monson Lake has a 1.2 mile hiking trail. Camden State Park - http://www.dnr.state.mn.us/state_parks/camden/rec.html Close to Marshall, this state park has 15.8 miles of hiking trails. Upper Sioux Agency State Park - http://www.dnr.state.mn.us/state_parks/upper_sioux_agency/index.html Located at the confluence of the Minnesota and Yellow Medicine rivers, this state park has 18 miles of hiking trails. For Ridgely State Park - http://www.dnr.state.mn.us/state_parks/fort_ridgely/index.html On the east side of the Minnesota River, this state park has 8 miles of trails. Flandrau State Park - http://www.dnr.state.mn.us/state_parks/flandrau/index.html Down along the Cottonwood River in New Ulm, this state park has 8 miles of hiking trails. Minneopa State Park - http://www.dnr.state.mn.us/state_parks/minneopa/index.html Located outside of Mankato, this state park has 4.5 miles of hiking trails. Minnesota Valley State Recreation Area - http://www.dnr.state.mn.us/state_parks/minnesota_valley/index.html Located in the Lower Minnesota River Watershed between Shakopee and Chaska, this state recreation area has 47 miles of hiking trails. Fort Snelling State Park - http://www.dnr.state.mn.us/state_parks/fort_snelling/index.html At the confluence of the Minnesota and Mississippi rivers, this state park has 18 miles of hiking trails.